Noise Records were always good at sniffing out new talent in the mid-Eighties (even if they weren’t so hot at marketing it) and Rosy Vista were one of their acts who should have been gone on to much bigger and better things. Instead, one five-track EP ‘You Better Believe It’ and a couple of singles culled from it are all the female four-piece managed before vanishing into obscurity once more. Fast forward thirty years and the band that disappeared in 1989 will finally have their debut album in the racks. 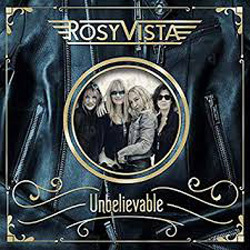 Featuring six new songs together with the five cuts from ‘You Better Believe It’ rehashed and re-recorded and one cover version, ‘Unbelievable’ is the work of three original members, Andrea Schwartz (vocals), Anca Graterol (guitars) and Marina Hlubek (drums) with new girl Angela Mann on bass. It’s almost certainly the six new tracks that will be the focus of most attention, and of those the bop-until-you-drop ‘Hopatina’ is the most immediate. Written by Gaterol, it’s apparently a rocked-up version of a pop song which was a Top 5 hit in her native Romania in the Seventies and it shouts its unusual roots loud and proud. Fun ‘n’ funky, it’s guaranteed to put a smile on your face: trust me on this. Elsewhere, the likes of ‘Changin’ My Mind’ (a song I’m a sucker for: if you want to write a catchy song of subtle depth and beauty, here’s the template), opener ‘Crazy’ and the possibly self-referential (depending on how you read the lyrics) ‘Poor Rosy’ all summon to mind the much-beloved Vixen of the late 80s/early 90s (who, to be fair, really just sounded like Rosy Vista), boasting hooks a-plenty and an endless well of melody. It’s a glorious body of work, and it’s interesting that the blend of old and new songs across the twelve tracks works well without either the veterans or the newbies sounding out of place. And although at one time it seemed at one time that everyone and their dog had their own version of ‘Born To Be Wild’ – even Ozzy Osbourne covered it, albeit with Miss Piggy rather than Rowlf – it’s actually good to hear it again, especially performed in such a high-octane way, and it wraps things up with some panache.